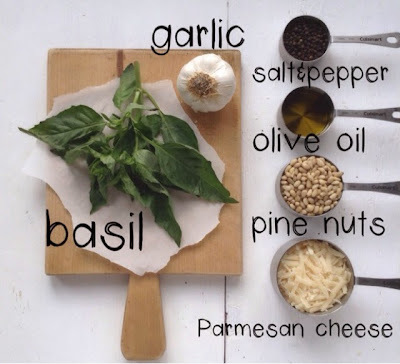 Pesto is a Italian basil based pasta sauce that originated from northern Italy. I've purchased pesto at the grocery store many times and tried many different brands. Until I made my own add loved the truly homemade taste.This recipe is very close to what pesto tastes like in Italy, and is one of the best pesto recipes around. For a fast and easy meal just simply cook your favorite pasta, then add some pesto alone with diced tomatoes and some Parmesan cheese. 1 First cut off all steams from the basil. 2 Then grate Parmesan cheese and peel the two cloves of garlic. 3 Measure out the other ingredients then add all ingredients into a blender and mix.